I clicked through to his post. “The toughest man to ever play for the Chicago Cubs is gone.” I went to the Tribune. “Ron Santo: Dead at 70.” It took a couple seconds to sink in, but when it did, I started to tear up. I’ve been a Cubs fan since a Saturday in May of 1984. Ryne Sandberg hit a triple, when I didn’t know what a triple was, and Ron Cey won the game in the bottom of the 10th. Up to that point I’d been a White Sox fan whose favorite player was Chet Lemon. That was the first time I can remember even knowing that the Cubs existed. I was 8 years old. In the years that have passed since that day, I’ve watched or listened to hundreds, if not thousands, of Cubs games on television and radio. When you listen to that many games, the voices that accompany them become the soundtrack of your life. You get to know them, not just as The Voices, but as people. Dewayne Staats. Bob Brenley. Thom Brennaman. You remember the cadence of their delivery, the stories they tell for the tenth time, the punchlines to the jokes that were never funny. Pat Hughes. Len Kasper. Steve Stone. You remember the conversations that pass the time during the 5th inning of the 100th game of a sub-.500 season. You remember Harry. And you remember Ron. Ron Santo was no showman. He was at his worst in times of great drama. He would yell incomprehensibly at victories, he would sit in stony silence in defeats. In short, he would do what you were doing, only in front of an open mic that broadcast out to 10 million people over the air. Like Harry, he also didn’t follow stats, and you sometimes wondered if he was even following the game he was announcing. He would forget players’ names, or even that they were on the roster. He would announce the score wrong, and be surprised that the Cubs were losing. But where Santo succeeded, where he was radio gold, was in that 5th inning of that pointless August game. He and Pat Hughes would start talking, and suddenly the game was secondary. You’d listen, not because you wanted to know if the Cubs would score to come within 4 runs of tying the game, but to hear what tangent the Pat and Ron show would go off on next. It was like sitting on the porch with your grandfather and listening to his stories one last time. It’s a hell of a thing, getting old. When you’re young, your heroes seem indestructible. The foundations of your universe seem immovable. Everything that is good and right endures, everything that is bad and wrong falters. It’s all black and white, and the line is a razor that cuts between them. But as you age, that line starts to feather into muddy shades of gray. Your heroes tumble. They are no longer gods that can do no wrong, but fallible men. The gifts that made them heroic no longer shine as bright. And those foundations, the ones that seemed so immovable, are worn to sand by the passing tides of time. 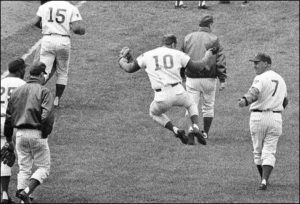 Ron Santo was a hero to a lot of people, both as a player and as a supporter of juvenile diabetes research, but I only ever knew him as the radio voice of a lot of bad teams. He never made it to the Hall of Fame, even though by any statistical measurement his accomplishments on the diamond rank among the best at his position. And now that he’s gone, now that he can’t enjoy the pomp and circumstance of being inducted, they’ll probably vote him in. You would like to think that there’s a Heaven, and Ron Santo will be able to enjoy it from there. That he’ll click his heels as he runs past the Pearly Gates. And when you’re young, when you believe in things like good triumphing over evil, it’s those thoughts that let you sleep at night. But when that line fades to gray, when you lie awake at night and think of all the injustices that occur not because of a grand evil plan but because of random chance or petty vindictiveness, you start to doubt. You doubt that good really does win out. You doubt that a life of doing the right thing really pays off. By all accounts, Ron Santo never doubted. For 50+ years he believed he’d live to see the Cubs win the World Series. He believed he’d live to see an end to diabetes. And now he’s dead.